The Internet has opened innumerable vistas to make money, for almost anyone with working knowledge of smart-phone, computer, and the Internet. Thanks to simple and easy money making ways available online, you need not indulge in any complex marketing strategies or draw business plans. Just about anyone. There are no special educational qualifications or skills required to make money online. Further, you do not need to pay anyone or make investments to start making money online. 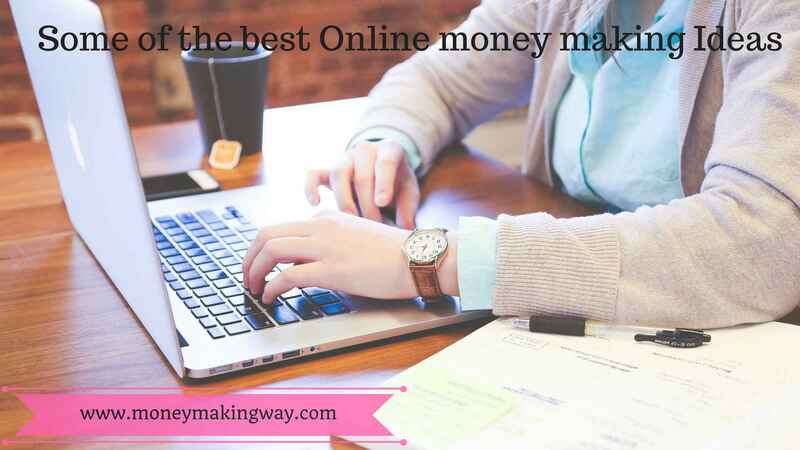 Regardless whether you are a teenager or businessman, housewife or professional, it is easy to make money online either to augment your income or earn a livelihood. Here we explore six major money making ideas for everyone. Reputed sites based in the US, Canada, UK and other parts of the world pay cash for taking online surveys. All you need to do is register on these websites by providing basic details and a valid e-mail ID. Additionally, you can select the area of your interest for which you can take surveys. These are based on anything from latest movies to music albums, Fast Moving Consumer Goods or services provided by companies. Regardless of which part of the world you reside, ample surveys are available to take online. You can earn anything from 50 US Cents to US$ 5 per completed survey. The money is paid to your PayPal or bank account- depending on your location and local laws. Alternatively, you will be paid through free shopping vouchers for major e-stores like Amazon. There are no upper limits on the number of surveys you can complete in a day or month. However, money earned will be paid only when you have reached the minimum eligible limit for a payout. Alternatively, you can opt to receive payment once you have earned a particular amount, in excess of the minimum payout. Colleges, universities, financial institutions including banks and insurers and scores of companies worldwide are saddled with paper forms submitted by students, customers and other entities. Storing these forms is cumbersome since they occupy lots of valuable office space. Additionally, the paper is highly susceptible to vagaries of nature and can get easily damaged by moisture, mold or termites and other insects. Hence, companies try to eliminate these bulky files by digitizing the data. The process is done by a group of individuals called data entry operators. The data entry means you will be provided paper forms or its scans by the organization. Additionally, you will be given access to templates of the company. All you need to do is key in name, address, date of birth or other details that appear on paper forms into the computer. Based on your typing speed and company, you can earn anything from US$ 10 to US$ 100 per day. Data entry jobs can be done from any location and it’s considered as one of the best work from home options. Micro-tasking is a trend that is growing worldwide. It involves doing small, odd online jobs full-time or during your free hours from any location. Additionally, you can micro-task with your smart-phone if the company that requires your services, provides an app. Micro-tasking is also a regular or part-time work to make money online. Generally, micro-tasking means you will be sent copies of news reports, advertisements, invitation cards, business cards, stationery, legal documents and other material that requires proofreading. You have to check such material for spelling, grammatical and punctuation errors. Corrected versions have to be emailed to the employer. Small micro tasks- meaning correcting one A-4 page online earns you 50 US Cents while proofing larger documents can fetch you as high as US$ 20. Armed with a good digital camera or with the one on your smartphone, make interesting videos that can be uploaded to the world’s second most popular website, YouTube. To do so, you will need to register on YouTube and open a channel free. Videos on popular topics, comedies, off-beat issues, shopping, unique scenes, lectures, talks and discussions by experts in any field or Do-It-Yourself (DIY) techniques draw great viewership. Alternatively, you can also upload videos of any old music or movies and other interesting clips which no longer bear copyright restrictions. You also have to register your channel on Google AdSense to earn money. When your channel starts getting subscribers, its popularity rises. Google AdSense will flash commercials and advertisements on your videos and channel. You get paid for every advertisement displayed through your videos and channel on which a subscriber clicks. However, no clicks on ads means, you do not get any money. This is a great way to make money for every Facebook and Twitter aficionado. Companies hire people who can manage their social media pages efficiently. This means, you will have to post content provided by your employer on Facebook and Twitter and respond to any positive or adverse comments immediately. Making money online as social media manager is possible fulltime or part-time and can be done from the comfort of your home or during commutes and travel, through apps. In cases where you are unable to directly respond to grievances or negative comments, all you need to do is refer the query to the concerned department of the employer. The job pays about US$ 15 per hour. For those with expert level fluency in English and a foreign language, providing translations online in real-time is very lucrative. You can earn as high as US$ 50 per hour, depending upon the demand for translations in the language. The work involves listening to live video feeds of online meetings and conferences and providing a two-way translation. Alternatively, you can provide an online translation of legal and other documents that are required by companies with the presence in foreign countries and individuals. Working as an online translator is fairly easy. Several part-time job websites like Gengo have multiple frequencies for a wide range of clients worldwide. Generally, most people do not make optimal use of their Internet subscriptions. While you may have a high-speed and reliable Internet connection at home, it can be redundant unless utilized fully to derive the value of your money. Instead, you can utilize the Internet, your computer or smart-phone to earn money. An increasing number of companies are now looking for online workers, either on the full-time or part-time basis. Indeed, statistics provided by US Bureau of Labor and Employment prove, about three to four percent of American population works from distant locations through the Internet. You too can earn considerable money by doing some online work.